There are ways to gain bitcoin exposure through instruments that can be bought with your traditional brokerage. These instruments range in size and volatility. As the prices of cryptocurrencies increase, there is more of a demand to mine them. Companies that produce instruments to mine these currencies will benefit from an increase in demand. 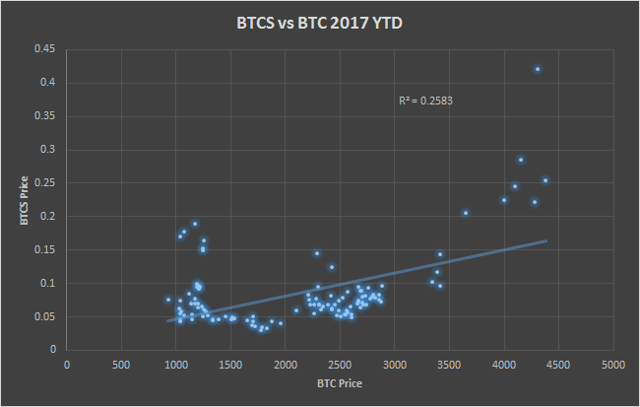 NVDA has been very highly correlated with Bitcoin in 2017. 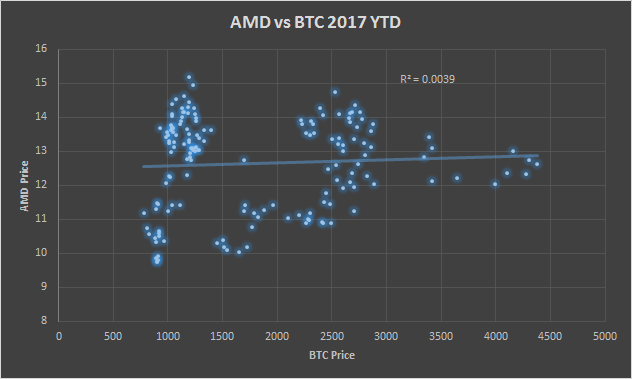 Advanced Micro Devices (NASDAQ:AMD) – AMD, another GPU producer, has benefited from the rise of cryptocurrencies. The popularity of mining cryptocurrencies, especially Ethereum, has increased demand for AMD’s graphics cards. AMD’s products have generally had the best reputation for mining cryptocurrencies. There are a handful of large companies that accept bitcoin as a payment for their products and services. It would make sense that as the price and popularity of bitcoin rises, companies that accept it as a payment would benefit. Some of these companies are Shopify (NYSE:SHOP), Overstock (NASDAQ:OSTK), Dish Network (NASDAQ:DISH), and Microsoft (NASDAQ:MSFT). There are various stocks trading in the OTC markets that are more directly related to bitcoin and electronic currencies. It is important to note that these stocks are very risky. MGT Capital Investments (OTCPK:MGTI) – MGT Capital Investments was for the most part a cybersecurity company, but more recently it has invested in the cryptocurrency space. MGTI has taken an interest in mining both Bitcoin and Ethereum. On May 22nd, MGT Capital Investments announced a major expansion of its bitcoin mining operations. On June 23rd, MGTI launched a pilot program to mine Ethereum. On August 25th, the company announced that it would add over 1,000 more mining computers. MGT Capital Investments is set to be one of the largest bitcoin producers in North America. 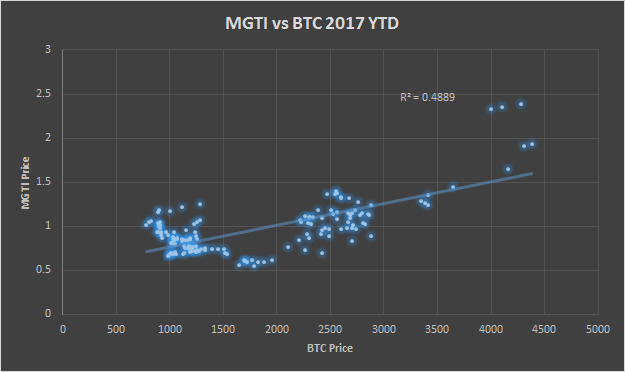 A large portion of MGTI’s price can be explained by movements in the price of bitcoin. Bitcoin Services, Inc. (OTCPK:BTSC) – Bitcoin Services, Inc. offers various bitcoin services. There are three main operations of the company. The first operation is offering a bitcoin escrow service. The company also engages in bitcoin mining and the development of blockchain software. BTSC is obviously very correlated with the price of bitcoin. BTCS, Inc. (OTCQB:BTCS) – BTCS considers itself the first pure play U.S. public company focused on blockchain technologies. BTCS has stated that in 2017 its goal is to broaden its digital assets and focus on mining. 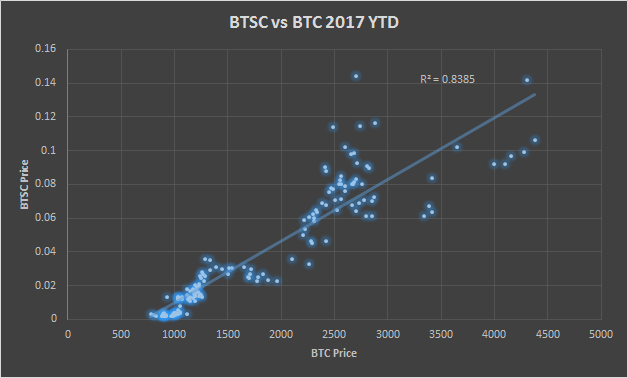 BTCS certainly is correlated with bitcoin, but includes a very high level of volatility. Note: Data is from March 13th forward. Global Arena Holding (OTCPK:GAHC) – Global Arena Holding is a company focused on acquiring technologies, patents, and companies relating to blockchain technology. Global Arena Holding has two subsidiaries: GAHI Acquisition Corp. and Global Election Services. 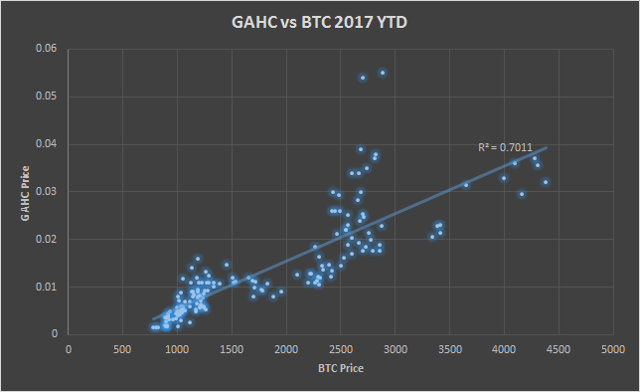 GAHC has a very clear and strong correlation with the price of bitcoin. There is currently a lack of exchange traded funds that track bitcoin. This may change in the very near future though. VanEck Bitcoin Fund – VanEck has filed for a bitcoin ETF and, if approved, it would be the first of its kind. This is a big IF though, because the Winklevoss Bitcoin ETF was rejected by the SEC earlier this year. VanEck may also have some competition when it comes to opening the first bitcoin ETF. Grayscale Bitcoin Investment Trust (OTCQX:GBTC) – The investment trust holds bitcoins and can be traded on your typical broker. I would be wary of OTCQX:GBTC though, because of the fact it trades at a premium. Bitcoin Futures – The Chicago Board of Exchange (CBOE) recently announced that it would be introducing bitcoin derivatives. The nature of bitcoin and the process of buying bitcoin are much different than traditional investments. This does not prevent traditional investors from gaining exposure to bitcoin in their brokerage accounts though. There are a handful of stocks available to investors that give different levels of exposure to bitcoin and have varying degrees of risk. Stocks like NVDA and AMD are larger companies that offer some exposure to cryptocurrencies while being relatively less risky. OTC stocks like MGTI, BTSC, BTCS, and GAHC offer the ability to leverage the price of bitcoin, but are extremely volatile and risky. Disclosure: I am/we are long BTSC, MGTI. Additional disclosure: The OTC stocks mentioned in the article are very volatile and risky due to the nature of OTC markets. Investors should take special consideration before investing in these stocks. The graphs in this article were generated using Excel with the data coming from Quandl and Yahoo Finance.